Working in the world of football media, creativity is important. I don’t see myself in competition with anyone else at another club, but nevertheless, for purely personal reasons, I do strive to be better at what I’m involved with. It doesn’t matter what job you do, always look to improve. 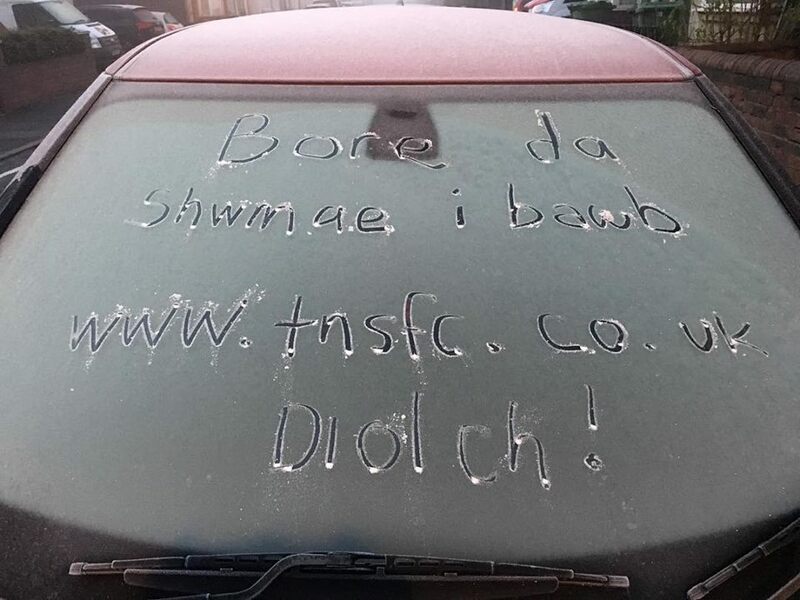 One of the things that I do at The New Saints FC, where I am the head of media, is whenever my car’s windshield is frosty, before scraping it, I write something in the ice. I then take a photograph and share it across the club’s social media platforms. It’s unique – well, I’ve never seen it elsewhere anyway – and catches the eye. As we are the champions of Wales, I also try and include some Welsh in there as well. I do translate once it comes to the actual social media posting. In the case of the above it says: Good morning, hello everyone. Then there’s the club website address and the word, thanks. Not just work though, be creative in all things. Learn to think outside the box and operate there as well. Often, the only thing that is holding us back is the perimeter fence that we have built in our own mind. Demolish all that which holds you back and when you do then real freedom takes its place. Develop a creative mind, don’t be held back by conventional wisdom. Keep up to date with my blog entries, and more, by liking my Facebook page and read more Rev’s Reflections HERE.